Next morning we left Namtha to Oudomxay where we checked into the best hotel in town, the Surinphone. 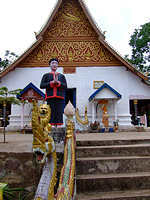 Oudomxay is a busy trading town with an interesting local market and pagoda. We enjoyed walking to the high street in the evening for our dinner at one of the local restaurants. The simplicity and basic nature of the local restaurants is very charming. Next morning we drove to Muong Khua. On the way we visited Muong La village and the 400 year-old Praxack Kham Temple. It was near the temple that we discovered a new and beautiful resort, Muong La Resort, opened only a few months ago. The resort is hidden behind a tall wooden wall. The gate opens into lovely gardens with 3 luxury bungalows on either side of the gardens. The end of the garden opposite to the gate is the river with mountain scenery beyond. It looks like a paradise. On the left near the river is a hot tub fed bya natural hot spring for relaxing among the natural scenery. On the right hand side is the restaurant and bar plus a sun deck for enjoying this lovely environment. This is a resort where luxury blends in with the relaxing natural beauty of the surroundings. We left here and drove on to Pak Numnoy for lunch at a little restaurant by the roadside. We had deep fried catfish and fried mixed vegetable and it was the best meal we had in the whole of our 2 weeks travelling. It was freshly prepared and cooked and we watched the cook cut each of the fresh vegetables in her open kitchen. The catfish is from the River. It is almost certain that the food was brought that morning at the local market. The taste was fresh and delicious. She also gave us a chilli fish sauce as a dip for the catfish. It was sensational. The restaurant has no name but it is Mrs. Mon's restaurant so we called it that. We arrived at Muong Khua in the afternoon and checked in Sernaly hotel. This is also the best hotel in town in this rural and non-touristy town. The town has no electricity except 4 hours each day from 18:00 – 22:00. At 5 o’clock next morning we were woken by the loudspeakers in the square announcing the news of the day. It was like Mao Zedong's days in China. We got up and walked down to a café for breakfast. We left Muong Khua by seven o’clock on a traditional long boat on the Nam Ou River. 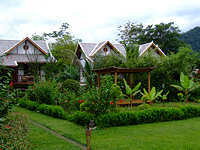 After 3-4 hours we reached Nong Khiaw, and stopped here to look at the Nong Khiaw bungalow resort. 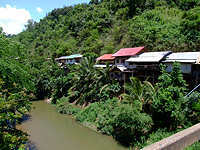 Nong Khoaw is a lovely town by the Nam Ou River. The environment is a very beautiful. 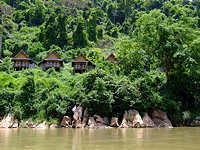 The resort rests high up on the river bank with a magnificent view of the river and its surrounding mountains on the other side. All rooms are built in lodge style in simple local materials and with a balcony and seats to enjoy the river view. After lunch at a local restaurant we got onto another boat for the remainder of the trip to Luang Prabang. This is a 4-5 hour journey. We sat back and enjoyed this lovely scenic river. We watched as the boatman skilfully manoevered the boat right or left through the many rapids. These boatmen know the river very well. 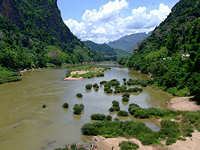 About 4 hours into the journey the Nam Ou River eventually runs into the Mekong and we motor up river to Luang Prabang. An hour later we arrived in Luang Prabang and checked in at the 4* Santi Resort. We visited this hotel about 4 years ago before the lovely swimming pool was built. We have been using it ever since with many good comments from clients. It is still a lovely hotel with very nice view of the surrounding countryside. We are continuing to use this resort in our superior hotels group. Next day was a busy one as we spent the whole day for hotel inspections in Luang Prabang. This city is getting busier each year with hotel demand exceeding supply especially in high season from November to March. We re-visited hotels that we are using for our tours, such as La Residence, The Grand and 3 Nagras etc., but we also visited new additions such as the Villa Maydou and Sala Prabang. Today we also moved to Maison Souvannaphoum for a stay of 2 nights. This lovely boutique hotel is highly commended by our clients. We are continuing to use this hotel in our deluxe hotel category. Mr. Richard Neo, the GM of this hotel, told us that there will be additional rooms built for next year. The new rooms will be in large bungalows beyond the swimming pool in the garden. Lunch today was the second best fish dish we had, curried catfish in Thai style. We ate at one of the restaurants by the Mekong River. Next day we had a rest day to walk around the city of Luang Prabang. It is still a very enjoyable city to walk leisurely among the shops and cafés. Luang Prabang is still one of my favourite towns.